Hi friends! My husband Gabe and I just got back from our 6 night cruise on the Carnival Conquest. We had an amazing time spending our 3rd wedding anniversary at sea and creating new memories together. The Conquest has one of my favorite layouts of the Carnival family of cruise ships. I cruised her sister ship (the Valor) a few years ago and love the ease of all the amenities. There is quite a lot to do while on the boat. 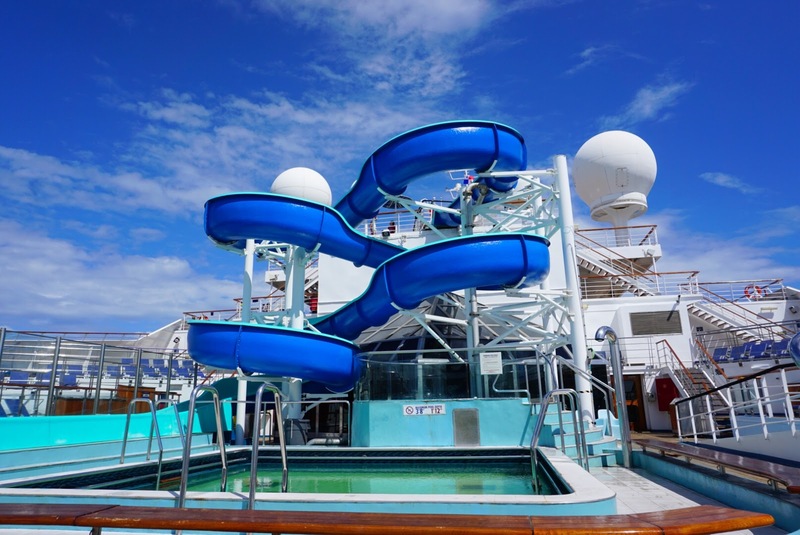 The Carnival Conquest has two pools and a large slide located on the Lido deck. 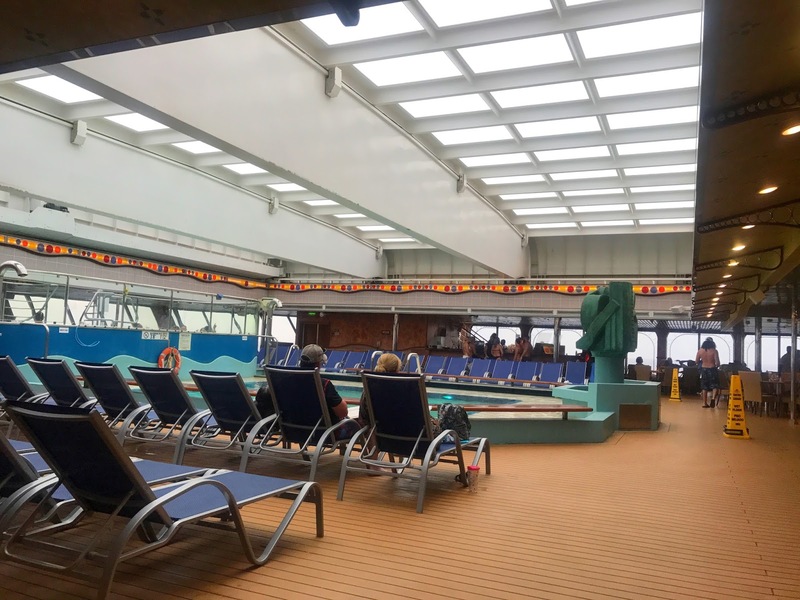 Aside from the main pool on the lido deck, the other pool is the Sky Pool which had a retractable roof covering the pool and two hot tubs when it rains (which it did nearly everyday). I wasn't so sure about the retractable roof when I first saw it but it became my BFF on the rainy day at sea! 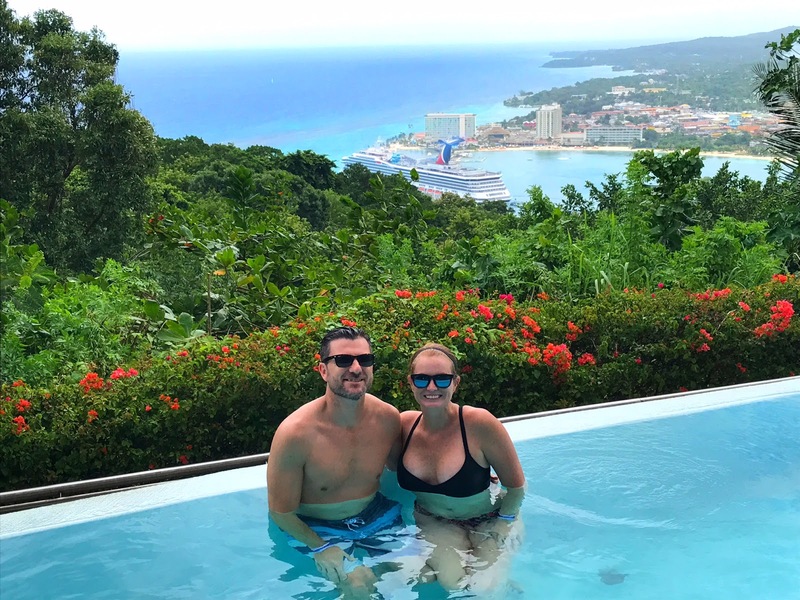 Along with the various pools you can also play putt putt golf, basketball, win at the Casino, rent books or board games from the library or participate in a variety of cruise organized activities. 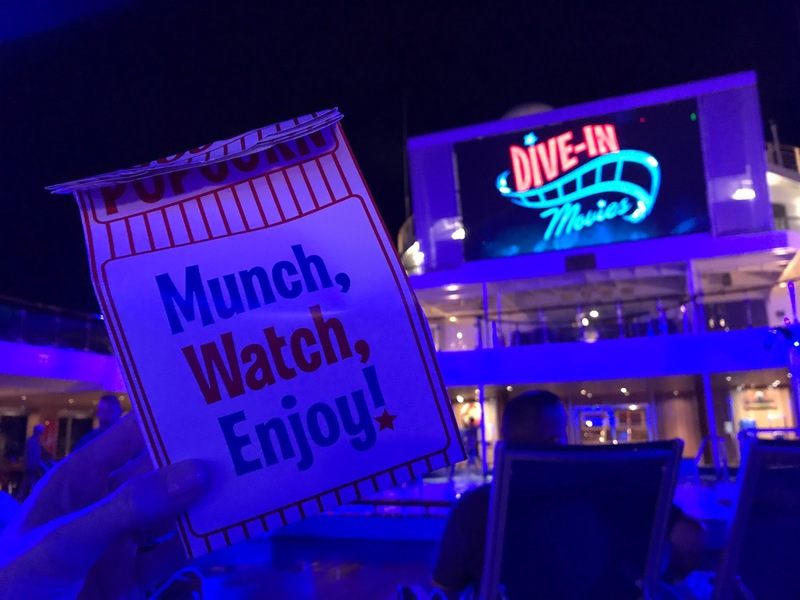 You also must watch a Dive in Movie at Sea - they provide the popcorn and two movies nightly under the stars. We watched Guardian of the Galaxy II which made me regret not naming our kitten Groot. One thing is certain - you won't go hungry on the Conquest. I am all about specialty dining at sea and choose my cruises based on what is offered. I was thrilled to learn that The Conquest had a Steakhouse, Guy's Burger Joint, Blue Iguana Cantina, Seafood Shack, Ol Fashioned BBQ and Sushi at Sea. On our 6 night cruise, we had dinner once at the Steakhouse, once in the main dining room, enjoyed Chef's Table on our anniversary, two dinners at Seafood Shack and one night eating sandwiches, soaking up the too many margaritas we consumed in in Cozumel. I strongly suggest all cruisers to at least book the Steakhouse one night. Here's a pro-tip that I talk about frequently - book your Steakhouse on night one at sea. You can choose between a free house bottle of wine or get 1/2 off any bottle - this delicious bottle of Silver Oak only set me back $55! If you are a foodie, please try to get in the Chef's Table. You have to book this far in advance - and I finally got to experience it after 5 failed attempts. It was one of the top dinners I have had. I will be doing a blog post on both of these dining experiences. There are quite a few bars on the Carnival Conquest with an abundance of talented bartenders. I never get the drink of the day and you'll rarely find me with a frozen drink. Instead I love the martinis and craft cocktails found on the ship. 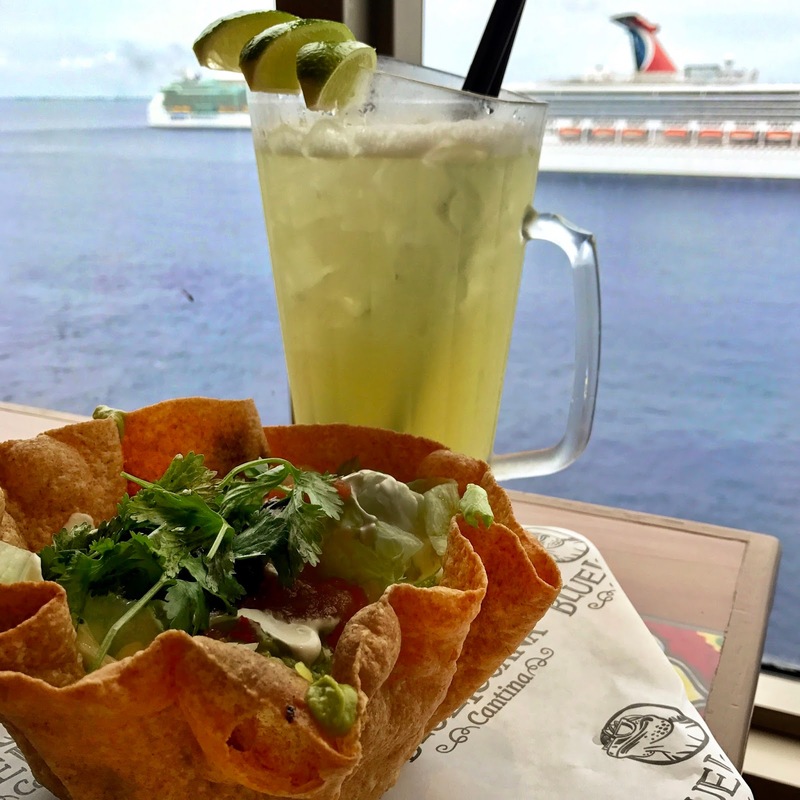 The Conquest had my favorite watering hole, the Alchemy Bar along with Red Frog Rum Bar and Blue Iguana Tequila Bar where we purchased a pitcher of margaritas to go along with my Taco salad and Gabe's burrito (not pictured). 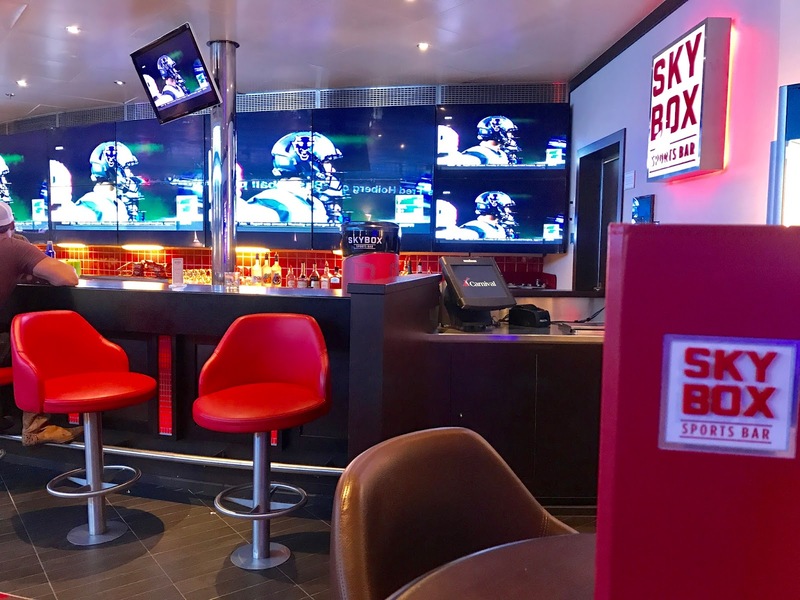 We also spent a lot of time at the Sky Box Sports Bar this trip. We even got on the boat first thing so we could catch some Sunday football! Be warned, this place gets BUSY during football season. Be prepared for a crowd and get there early for a prime seat. I must mention that on this trip, I did not buy the Carnival Cheers package. When my best friend and I go on cruises, it makes sense to do this - but being my husband isn't a big drinker, I couldn't justify the spend. So we brought on one bottle of wine each that is allowed by Carnival and I bought extra bottles at half off on night one at the steakhouse. Not buying the Cheers Package actually worked out in my favor this time. We stayed in a Balcony State Room on the 6th floor and ended up switching rooms after the first night due to an AC problem. Carnival was quick to move us, without us asking for a different room. Our second room was on the 9th floor right in the middle of everything and we loved it. The photos below are from our original room but they looked exactly the same. The room was 220 SqFt and we never felt cramped for space. The couch converted to a bed if you had a larger family. The room featured a mini fridge which we were very thankful for! Most cruises, I watch the sunset with a glass of wine. 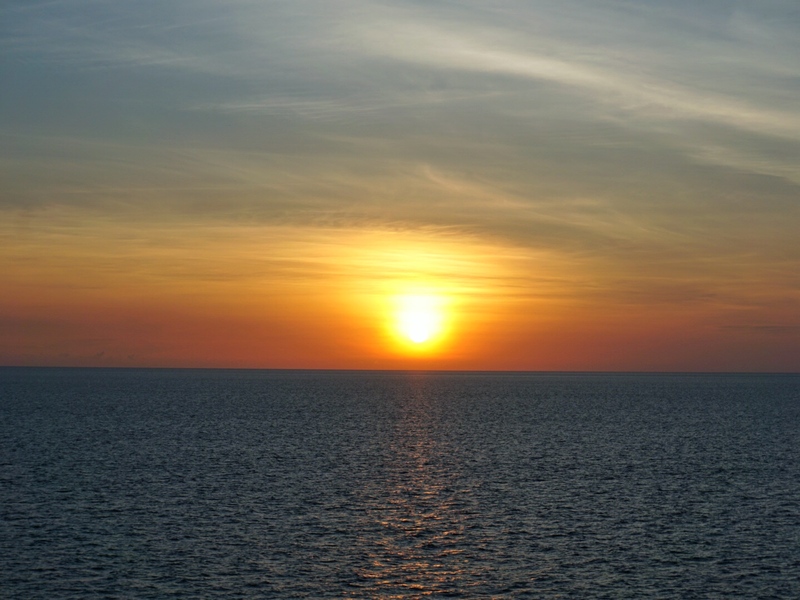 This cruise, I woke up on my own and caught my first sunrise at sea! All I wanted to do was relax on those 6 nights and I got just that. 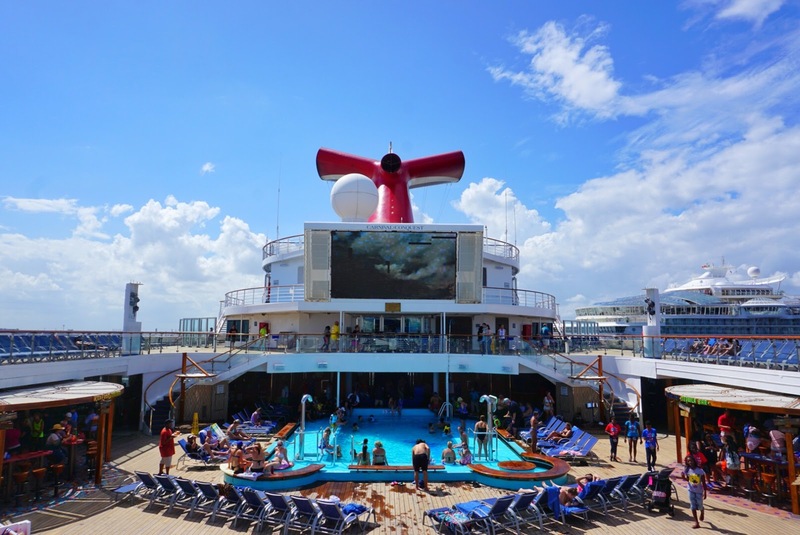 Carnival adjusted quite a few of their itineraries after Hurricane Irma and Hurricane Maria. Ours was impacted and our new course brought us to Ocho Rios Jamaica, Grand Cayman, Cayman Islands and Cozumel, Mexico. 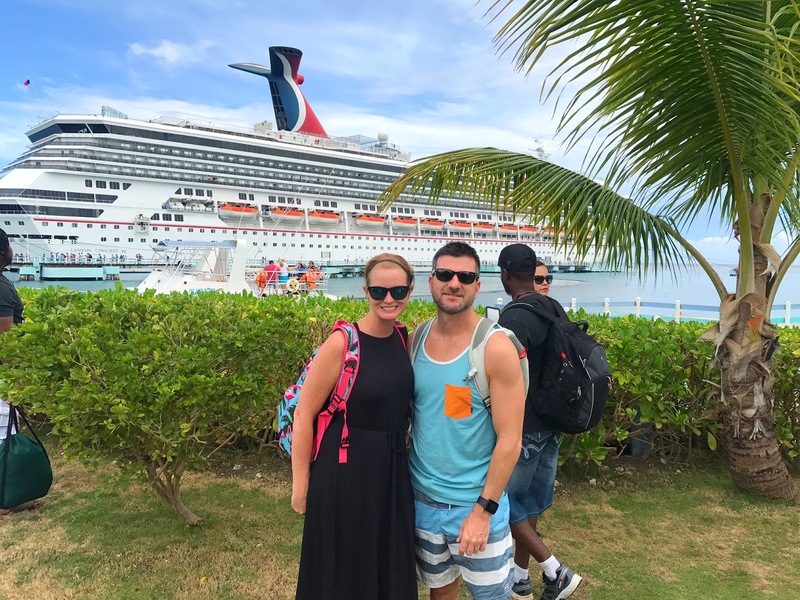 While I was looking forward to experiencing three brand new ports (Ocho Rios, Dominican Republic, Turks and Caicos) I was excited to share Cozumel and Grand Cayman with Gabe. The Conquest currently sails out of Fort Lauderdale to the Caribbean, Bermuda and the Bahamas. 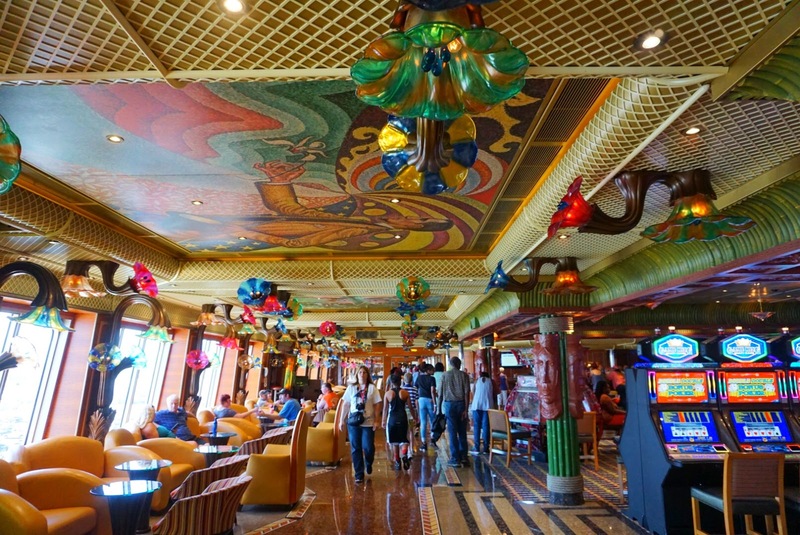 The Carnival Conquest designer Joe Farcus used the works of the French Impressionists and other 19th century French artists for the ships decor. 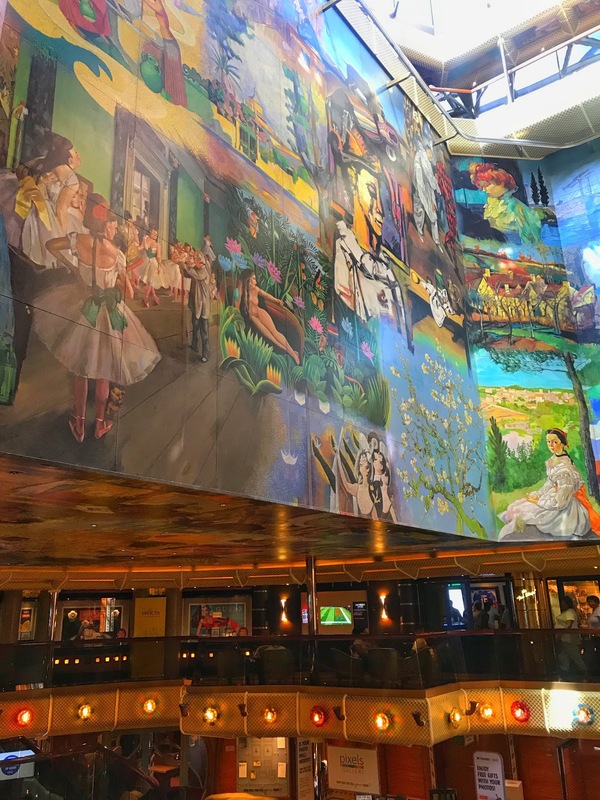 Most of the art you see throughout the ship are from popular artists and you will recognize their work within the murals. Gabe and I are both art collectors and love going to museums so we both enjoyed the murals throughout the ship. Speaking of art - we attended the first art auction, won a piece of art and spent a lot of money on some Daniel Wall pieces. That's another story for another day! Carnival Conquest spa offers a large variety of treatments and offer specials throughout each day. We planned on getting a couples massage but ended up passing on it this time around. However, we did visit the gym a few times which you access through the spa. Along with tons of treadmills and cardio equipment, you will also fine a sauna and steam room that are free to use. Overall, we had a great trip on the Conquest. The staff was super polite and attentive. Although it was raining, the seas were calm and I never got seasick once (whoop!!!!!). Everything we had to eat was really good and I may be on a Guy's Burger Joint detox as I type. I am already dreaming of my next Carnival Cruise!